If this is the deciding factor that makes a person immigrate from one place to another then there is a serious lack of common sense within the given population, or there must be something on the horizon that is absolutely terrifying to those that utter such words. Those fleeing a country as “political refugees” are not allowed to rise to the same level of those fleeing from civil war or genocide. Canadians won’t likely open their arms wide to those that are throwing, what amounts to, a giant hissy fit because their candidate didn’t win. This is not how immigration works nor how it is meant to be used. Instead, refugees from third world countries or those countries ravaged by war are often given much more consideration. Canada is far more fair-handed in its treatment of those with a real desire or need to immigrate, preferring to open up to those that truly want to be a part of the country for reasons other than their own desires. Making your way to Canada is not too hard if you show that you have some aptitude for work or if you’re seeking to gain entry to study at one of its many institutions. Anyone that can and will contribute to the economy in some way often receives a better welcome than someone just running somewhere because they feel the need to get away from their country’s politics. If you have family in Canada already it would be possible to apply for a temporary or permanent worker visa, which is not entirely hard to do. 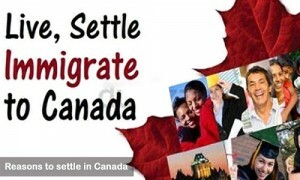 Even if you don’t have a family or a job offer waiting for you in Canada the admission that you are seeking or a job can help determine what kind of immigration program might be best for you, provided that you’re eligible of course. Some regions of Canada might actually be a little harder to get into, such as Quebec, but many others are actually recruiting workers to come and bolster the local economy due to labor shortages. Canada is reportedly creating more and more jobs to make up for it’s slightly above-average unemployment rate. This can pave the way for immigrants seeking work as more and more people will be needed to fill positions.